V is for victory. Like when you hit the pick 5 and win two grand. Or is it for Venison? Or is it for a very happy birthday to one of my favorite ex wagering ambassadors? 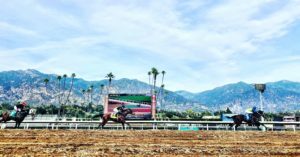 If it’s February 10th then you can find me at Santa Anita Park, the great race place helping new fans try to make a little extra money wether that is betting our early Pick 5 for the big bucks, our late Pick 4 or our awesome new inexpensive and super fun parlay wagers. 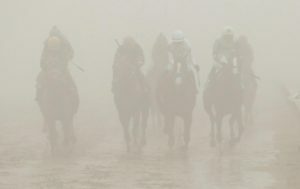 How do you want to make some money on the ponies today? Well lets start with the first race; A $12,500 claimer for 4 year olds and over. None of these guys are overly fast so I will spread in my Pick 5. That being said Big Champion and Squared Squared are my top picks. The Problem with Big Champion is he has been off for over a year. If he comes back the way he left he may show up. 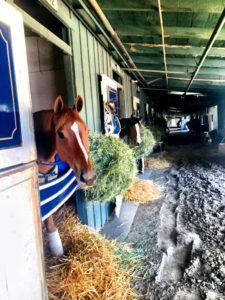 Or he may need a race.The John Sadler trained Squared Squared has some fantastic workouts since last raced (Jan 27 LA 1;00 driving 4/22) He’s dropping in class and likes Santa Anita and this distance. Now how about the 2nd race, another $12,500 claiming race. I like Kaboom in here as my top choice. Miyadi is one sneaky trainer but he does appear to have the top choice in here with improving rider Franco on board. Next up in the 3rd race we have our first turf race of the day, an optional race. I love Maestro Dearte in this spot. Nice maiden win in that last turf race with a good Beyer number. Improved from the first start. I also used Temple Keys, A horse who always shows up and has improving numbers. It’s hard to leave a horse like that off of your Pick 5 ticket. This is also the first race I decided to start a parlay ticket. I would use either the 1 or 3 to place or start multiple parlay tickets. Both the five and the six in this race are excellent long shot horses to use in trifectas also. The 4th race is the Santa Maria our first race stakes of the day. I singled Unique Bella in my pick five here because she is simply the best horse in the race. If you would like to make another bet on this race I would recommend hammering a straight exacta with 5 on top and 4 underneath. Shenandoah Queen Maybe the prettiest horse to bet on in the 4th race, but I don’t think she’s going to be the eventual winner. In the fifth race we have a very competitive stakes race at a mile on the turf. In my pick five are used one two and three but the 3 horse Blackjackcat is definitely about the horse to bet here. He is the class of the field. The old war horse Om has not run well in a while but sports a very nice work pattern and could definitely win this race on his best day or definitely show up for a piece so I will include him also in my Pick 5. 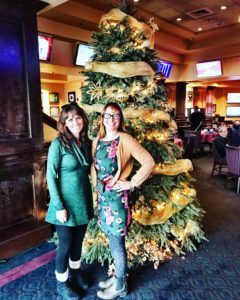 When we are not betting the Pick 5 and posing by Christmas trees at Los Alamitos Race Course together, Judy and I love to play Santa Anita Parks brand new Parlay bet! It’s such a fun and inexpensive way to have a good time playing the ponies! Also it’s Judy’s birthday today, so happy birthday to a great horse racing loving friend! Pick which races you want to parlay in your combination. 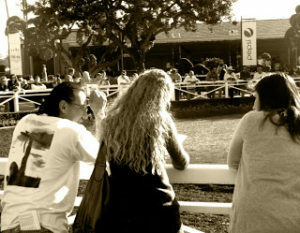 Decide if you want to bet your horses win, place or show. Throw in all the horses you love, place your bet and good luck!